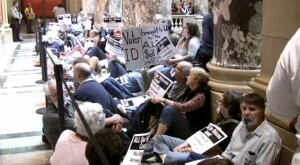 Last week, About 250 loud and boisterous opponents of the state’s Voter Photo ID constitutional amendment shouted and chanted and then silently moved outside the Senate Chamber in the State Capitol and laid down on the floor of the hallway. Their signs told their story of opposition. They say the GOP-led push for Voter Photo ID is unnecessary, expensive and disenfranchises many voters and is opposed by most voting agencies. If Minnesota voters approve it on the November ballot, it would essentially kill same-day voter registration, a reason often cited for the state’s high voter turnout. The protestors were joined by three supporters of the amendment, who repeated the fear of voter fraud. The Senate ignored the silence and went on to approve the amendment on a party line vote, which will put it on the 2012 ballot. Two proposed Minnesota constitutional amendments aimed at boosting the Republican turnout backfired horribly on Tuesday night. Not only did they both lose, but they may have inspired a large Democratic turnout that swept Republicans out of power in both chambers of the legislature.